Yesterday was a rough day. Smarty Pants took a tumble off of his bike and hurt his lip and hand. Nothing serious, but he was pretty shaken up about it. That was really the first time that he got so shaken up about hurting himself, and it was pretty saddening to see. Even when we tried to comfort him, he didn’t always want it. He fell asleep pretty early, so hopefully he will get a good night’s rest and feel better in the morning. I guess this is all part of growing up. Of course, as parents, we feel our kids’ pain, at that can be tough. Speaking of growing up, and on a brighter note, we have seen very strong developments in Smarty Pants lately in terms of what kind of play he engages in and how well he communicates. It is amazing to see him grow and develop this way. He is 2 yrs and 7 months old now, and loves to build towers and structures. 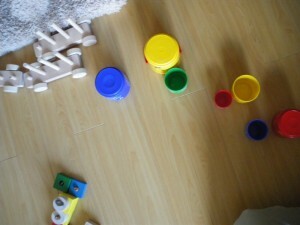 He also likes to organize toys and everyday items in rows and in different designs. He also likes to put puzzles together a lot more now, and can put them together by himself. If you have a toddler of this age, I highly recommend getting any kind of building blocks or Duplo for him or her. Get lots of them, because they love to build things really really high and wide. From the pictures below, you can see what kind of fun can be had with something as simple as a handful of acorns. In my series on Money and How to Reduce the Cost of Kids, I will be sharing more ideas on how to use natural, inexpensive, everyday objects to engage your child in enriched and mind-stimulating play. The below photos are also my second entry in Building Camelot’s “Pictures of Life with Kids – Parenting Behind the Scenes” challenge. My first entry, and the rules for the challenge, can be found here. If you are a parent and blogger, I encourage you to take part. The main stipulation is that the pictures cannot show human faces. These are all pictures of structures that Smarty Pants built using acorns, some stones, and building blocks from a wooden train toy. You can see the parts of the train (sans blocks) in the last two pictures. Feel free to leave a comment if you like the pics or like these ideas! 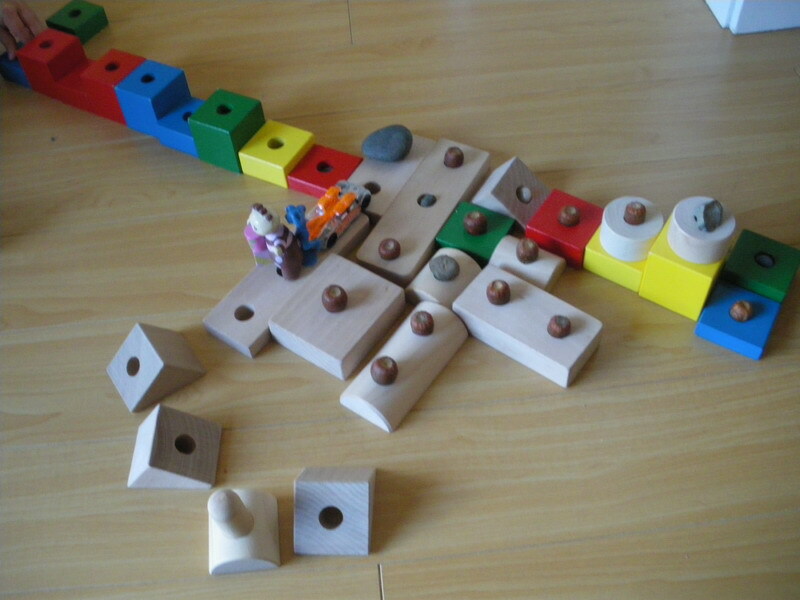 These are very cool – my daughter turns 3 on Sunday and we bought her some building blocks. I think she’ll like them pretty well and I agree that kids love anything that’s “big” and “tall”. Thanks again for taking part in the challenge – I just published my third set of pictures this morning and if I had waited, I would have included a link to this post. I’ll make sure and catch up with you next time I post some pictures. Thanks Tyler, I enjoy sharing these photos and taking part. I saw your third set, and I really liked it. 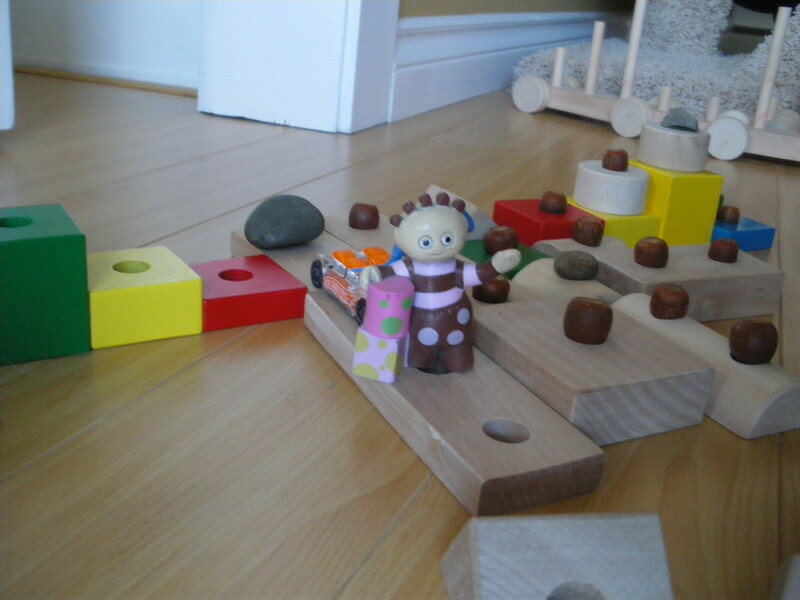 Hopefully we’ll see some of the structures that your daughter builds with her new building blocks in your next set! Isn’t it funny how much more they love simple, natural playthings instead of beep beep plastic ones. My girls are 5 and 7 and they still build with blocks on a regular basis. @Treemama, yes, and we really encourage it. We think it is really great. We have so few beep beep plastic toys, and he rarely looks at the ones we do have. I hope our kids are still building like this when they are older like yours! I just appreciate that you’re helping to spread the word. In my latest entry, I’ve heard from a couple more bloggers who might participate and it will be great to see even more pictures. @Tyler, that’s good to hear! Happy to help, and I like this challenge, its like buttah!